Deep Freeze: "The United States, the International Geophysical Year, and the Origins of Antarctica's Age of Science"
"Disney camera crews accompany the U.S. South Polar Expedition to Antarctica. "Operation Deepfreeze" is the second of three Disneyland episodes commemorating the US-Antarctic participation in the International Geophysical Year of 1956. Like the earlier Antarctica, Past and Present", this installment details the activities of Navy Task Force 43, with narrator Winston Hibler detailing the 43rd's latest scientific findings at the South Pole. These two episodes, combined with "Antartica--To the South Pole for Science" would be released theatricallly in 1958 as the Disney featurette "Seven Cities of Antartica". Nature reported in 2013 that Lockheed Martin was the contractor that run the US bases for the NSF. 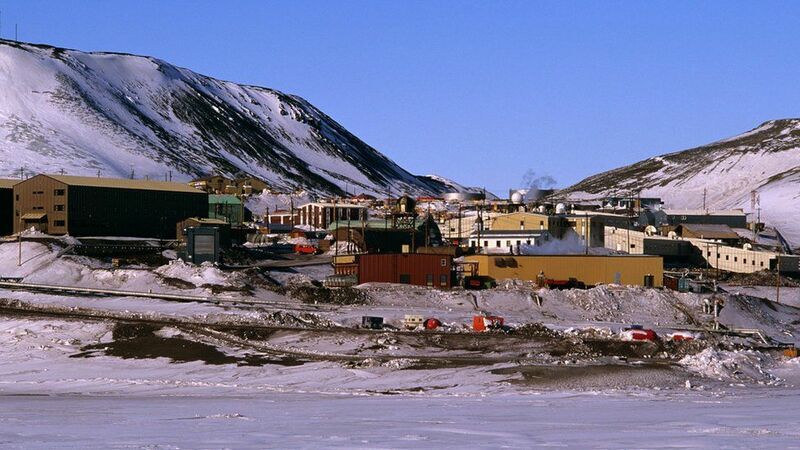 McMurdo was powered from 1962 to 1972 by a nuclear reactor and it is the biggest settlement on Antarctica, with a population of about 1,200 during the summer. The Amundsen-Scott South Pole Station is on the Geographic South Pole. The original station was built by the Navy in 1956 to serve the scientific goals of the International Geophysical Year, an international effort to study the geophysics of the poles of the Earth. "7 Obscure, Remote and Super-Geeky Military Bases"
"Along the frigid northwestern coast of Greenland lies one of the U.S. military's most isolated bases, and home to one of the Pentagon's primary tools for keeping an eye out for intercontinental ballistic missile launches: a giant phased array radar. Called the Ballistic Missile Early Warning System (BMEWS) at Thule Air Base, the radar works by blasting a constant beam of radio waves off the ionosphere, instantly detecting any object flying over the North Pole once it crosses the horizon." Note the incident at the Dugway base which was locked down for 12 hours when a vial (1/4 of teaspoon) of nerve agent VX was reported missing. (The vial was found later at the base). “In 1987, Chappell and the RIMS team published a paper describing the polar ion fountain and described the ionosphere as a "fully adequate source of material for the magnetosphere." "Dominique Delcourt, then working at NASA/Marshall, developed a program which takes the data from TIDE and shows particles zooming up to 60 Earth radii (almost 400,000 km) into the magnetotail, zipping back along the plasma sheet, and then bouncing back and forth along the Earth's magnetic field lines." "The last effect is called mirroring. As a particle moves along a magnetic field line, its orientation to the field line changes until the particle is repelled towards the other pole. How deep the particle penetrates depends on its angle with respect to the magnetic field. If the angle is aligned with the magnetic field, the particle will hit the upper atmosphere and cause the aurora borealis or australis. If it is at right angles, the particle will mirror and head in the other direction." 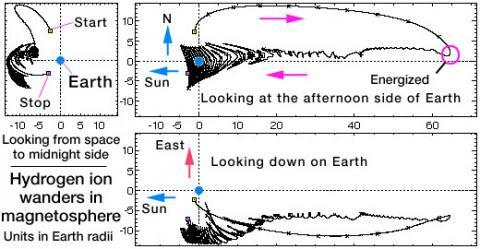 "The artificial plasma clouds are detected with HF radio soundings and backscatter, ultrahigh frequency (UHF) radar backscatter, and optical imaging systems. Ground measurements of stimulated electromagnetic emissions provide evidence of the strength and frequency for the electrostatic waves that accelerated ambient electrons to ionizing velocities."